As we walked into the Z gates area, I was amazed. It was completely quiet, and nearly devoid of people—I think there was one guy sitting there reading a book. This was on a Sunday afternoon, around 4:30pm, and the airport was bustling (20 minutes to check bags, 15 minutes for security). It’s not a huge area, but it’s clean, well lit with lots of windows, and down at the end, there’s food and drink, courtesy of a Subway shop. In addition to peace, quiet, and food, there was a multi-outlet USB charging station and a number of power outlets. What more could one need? The windows look out towards Concourse A, giving a nice view of planes transiting across Dulles, and arriving/departing from the Concourse A gates. The Subway shop was a perfect spot to grab a quiet dinner—interestingly, the clientele was basically all airport workers, other than us. Employees were also nearly all of the foot traffic down the Z gate area, too—this area seems to be favored by the employees, probably because of the peace and quiet. So how do you find this oasis? It’s not really hidden, but you do have to keep an eye out for it. As seen from above on a mapping site, the Z gates are on the right side of the bus departure area, as highlighted in the image at right. As you approach the bus (and train, though that may be down a level?) 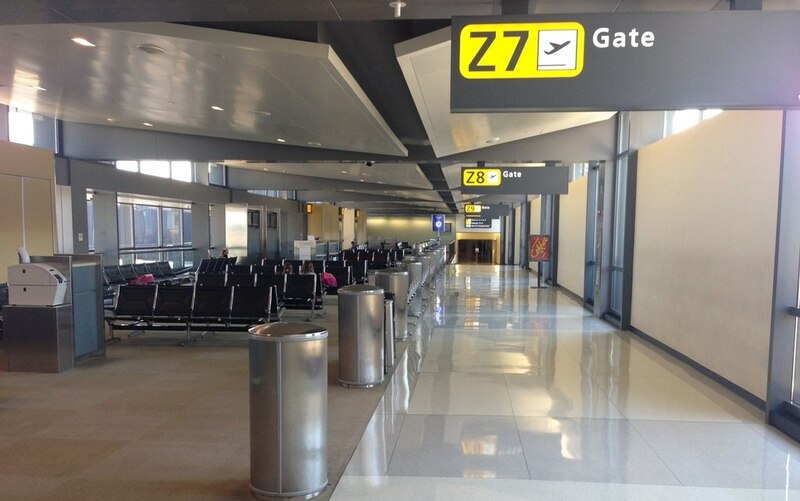 departure area on foot, look to your left, and you should see the Z gates concourse. I have no idea what traffic goes into and out of those gates, though I’d guess it’s small regional jets and/or turboprops. And who knows, perhaps they’re busier at other times of the day or days of the week. 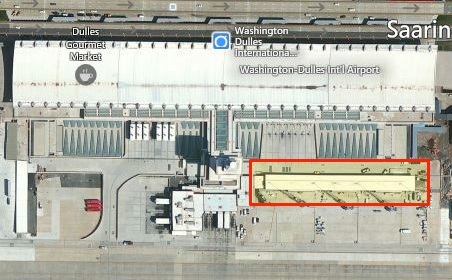 But if you find yourself with some excess time at Dulles, and you’re looking for a nice quiet hideaway, the Z gates area may be just what you need. 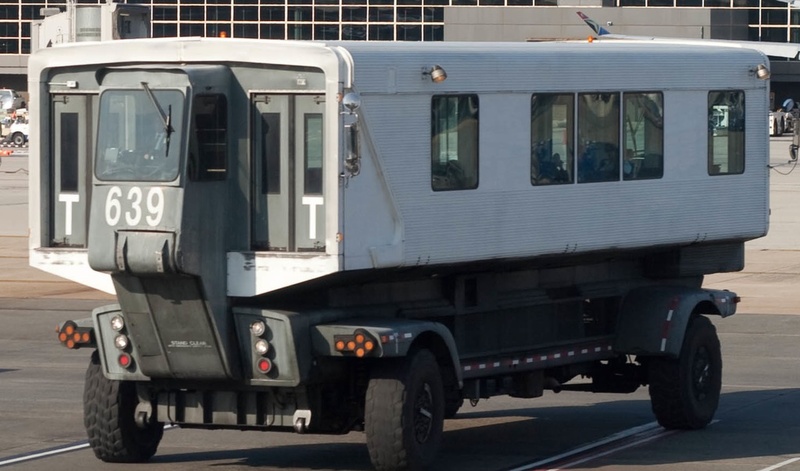 I remember the giant wheeled land “crawlers” at Dulles. I also remember when the Denver airport was upgraded (they actually used the old Stapleton airport for filming Die Hard 2 – set at Dulles airport) to the new circus tents. I mainly try to fly out of National/Reagan airport, which is also improved and accessible by metro rail (unless you have a very early or very late flight). 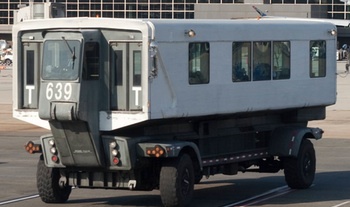 So the metro rail system is coming to Dulles (this, too should have happened years – or decades ago). If they keep improving things and sack the TSA – and for good measure the NSA, flying might just become enjoyable again! The government and the powers that be could actually ENCOURAGE flights and flying … would that not be strange? I know that Frontier and Silver Airways both use those gates.